We provide advanced herbal formulas made with organic or wildcrafted herbs. All of our herbs are tested for quality and purity. They are "Nature Made" products without pesticides, chemicals, additives, or fillers. This commitment to organic herbs insures a stronger, better animal, a healthier environment, and superior formulations.This promotes improvement and maintenance of the healthy horse. Willet, retired at eight with winnings of $800.000.00 She enjoyed our formulas every single day for six years during her racing career. She retired 100 percent sound and will be in foal shortly to PIONEER OF THE NILE, sire of AMERICAN PHAROAH 2015 triple crown winner. and reliable results since 2004." Horses, as herbivores, are guided by and vibrate to the natural intelligence of plant life. The wisdom of selection for survival is an ever-present and potent factor in the choice a horse makes in it's diet. Those choices determine it's rate of growth, repair, performance, attitude, life span, and most importantly, how it's immune system functions. Horses have existed and evolved on plant life for over 60 million years. Herbs are essential to the achievement of perfect equine health. Horses standing in enclosed areas for long periods of time without the relief of eating on the move (as in the wild) are prone to digestive problems (colic), edema (water retention), congestive lung conditions, infections, allergies, nervousness and mental anxiety. Noise, separation, toxic chemicals, sprayed and processed feed, drugs, social urges, fear and boredom all contribute to glandular wear and tear. This is especially true when the horse cannot respond to it's flight urge and move away. This creates a toxic load of excess hormones that produce fatigue and illness. Poor pasture and soils contribute to further depletion. Horses hunger for enzymes, minerals and vitamins found in the life-giving properties of herbs. Herbs help to restore and relieve many of these debilitating stressors. Herbs for herbivores are perfect, functional cell identified foods which provide easy digestion and assimilation for optimum healing and support. 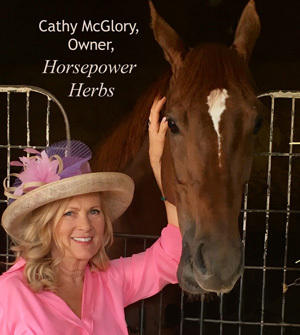 Herbalist and owner of HorsePower Herbs Cathy McGlory began her thoroughbred career with Calumet farms in 1969 in Hialeah, Florida. Cathy spent 12 years working with thoroughbreds in a number of positions ranging from groom to jockey. Cathy has studied with the Bastyr University in Seattle, Washington. She is also a graduate of the Herbal Healer Academy in Arkansas. She has been active in the field of natural medicine since 1987. Cathy has extensive experience with bleeders, chronic ulcer cases, and many inflammatory conditions. She works daily on the racetracks of America to insure better nutrition and performance for these horses.